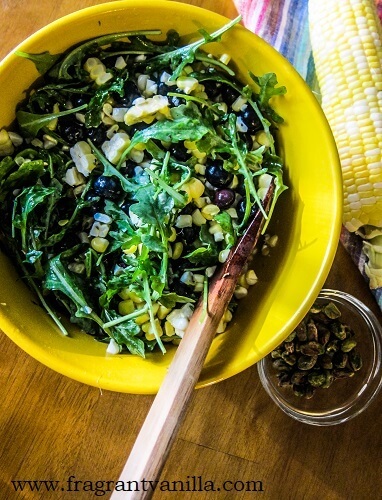 Some people think it is weird to eat sweet corn raw, right off of the cob, but when you get really good fresh organic sweet corn, it is so delicious that way! We have loads of fresh sweet corn here in Minnesota right now, it is the peak season, and nothing compares to it. Sure you can get frozen corn all year round but it is not sweet and the texture is not the same. I learned about the eating it off of the cob thing from Eric, because he always does that. Growing up, I was taught to cook my corn and drown it in butter (which is the most popular way to eat it here probably), but it is so sweet and delicious raw, I can't believe I hadn't tried it until about 5 years ago. I now like to include it in my salads raw. 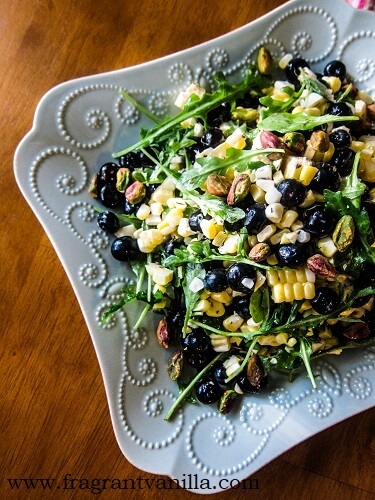 I was gifted some organic sweet corn and blueberries earlier this week, and I decided that they would make a delicious salad together! I wasn't in the mood to make anything complicated or time consuming, and this was perfect! It only took me about 5 minutes to make minus cutting the corn kernels off of the cobs. I wanted to keep the ingredients simple, because the corn and berries were so fresh and flavorful even before adding anything to them. I added some arugula, because I love greens in pretty much 95% of my salads, and I love the peppery bite it gives. Just a little scallions and thyme for a savory flavor, and some pistachios for crunch and I had all of the components but the dressing. My favorite go to dressing is a blend of just lemon juice, avocado oil and sea salt, and that was perfect with this! 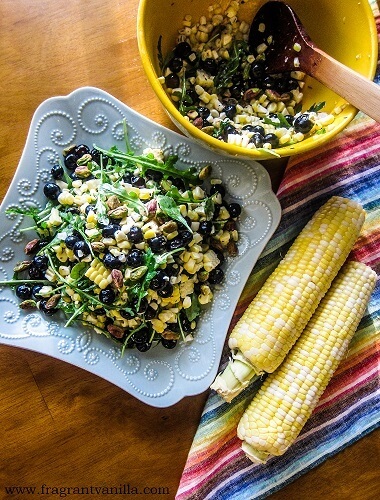 The corn and blueberries were sweet, and the lemon juice balanced it out so it all blended together well. This is so good! I think it would be the perfect thing to bring to a picnic, or to make ahead of time to include in your lunches. I get kind of excited when I have a good salad I brought to work for lunch. Yes, I know I am a nerd and I am motivated by food, but what can I say?! Good food is important! 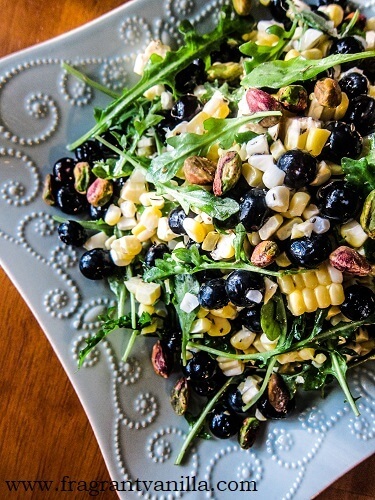 In a large bowl, combine the corn, blueberries, arugula, scallions, and pistachios. In a smaller bowl, whisk together the lemon juice, avocado oil, thyme and sea salt. Pour the dressing over the salad in the bowl, and mix together gently until it is all combined.